Project Risk Management is an absolutely integral part of a Project Manager's job and the way these are dealt with will have a a profound impact on the success or failure of the project. Now you may well ask yourself why Project Risk Management is so important? I certainly did when I started in project management. After all surely if you spend the time in thoroughly investigating and planning the project, then why should any problems occur? 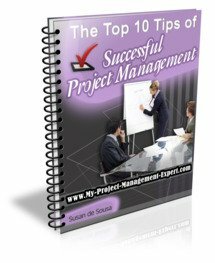 As I quickly learned, if project management was simply about creating a plan and then voila it all just happened, well there would be a great many unemployed Project Managers wouldn't there! After all if nothing ever changed and there was never any risk of anything problematic happening which would require the project plan being amended then 95% of global IT projects wouldn't fail! Good project manager's instinctively understand and can determine risk. They also understand that on all projects, the unexpected always happens and usually at times least expected. So what can be done about project risks? Well the first thing to understand is that there are usually two kinds of risks which a good project manager will have already mentally quantified. These are personal and project risks. Both are equally important. A project risk is one which may impact the ability of the project to deliver if not mitigated. Personal risks however are the one's which may impact your personal reputation. Remember as a project manager reputation is all important. It doesn't take long in this business for a project manager's position on a project to become untenable. Now the reason I've highlighted this is because all too many project managers try to hide the real project risks from their project sponsors and clients. Sometimes this is because of the paperwork overhead. Sometimes it's because the project manager can't think of a good way to mitigate the risk. Either way this "cross your fingers and hope for the best" approach might work in the short run by covering up the reality, but if the risk actually materialises and the project is impacted as a result, guess who will take all the flack? Worse still what would have been a project risk, promptly becomes a personal risk. Experienced project managers instinctively recognise the need to mitigate risk and create options when things start unravelling. They do this by facing up to the Risks and actively managing them. Further, by communicating them upwards to Project Stakeholders they ensure that their own personal reputation and position is covered. There is a fine line between Project Risk Management and going completely overboard to the detriment to the project. I know of small $500,000 projects where the Project Manager felt the need to have 500 risks listed in the risk log. The project wasn't particularly risky, but the Project Manager felt this was the only way to completely cover both himself and the project should things go wrong. Do not do this. Keep reading on and learn how to keep yourself covered and deliver the project without spending 2 hours a day maintaining risks.